Posted in Indie Polish, Mainstream Polish, Manicures, Nail Swatches, pictures, reviews	by Jessica W.
Oh Monday, why do you come so fast? It seems like you race toward us every weekend. 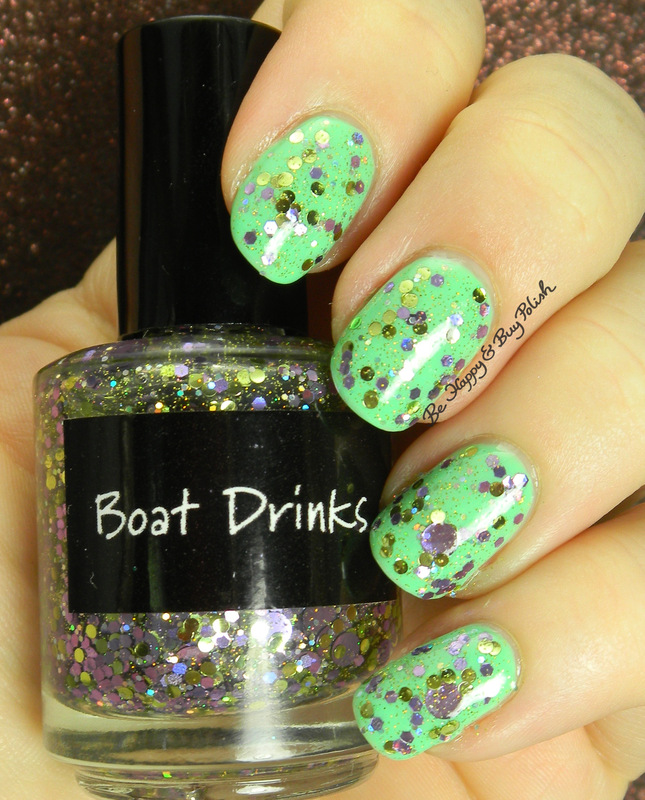 *le sigh* Good thing that today I have a spangly nail polish combo with CrowsToes Boat Drinks and Verity Soft Green. Verity Soft Green (previously swatched) is a really lovely brighter minty green nail polish. 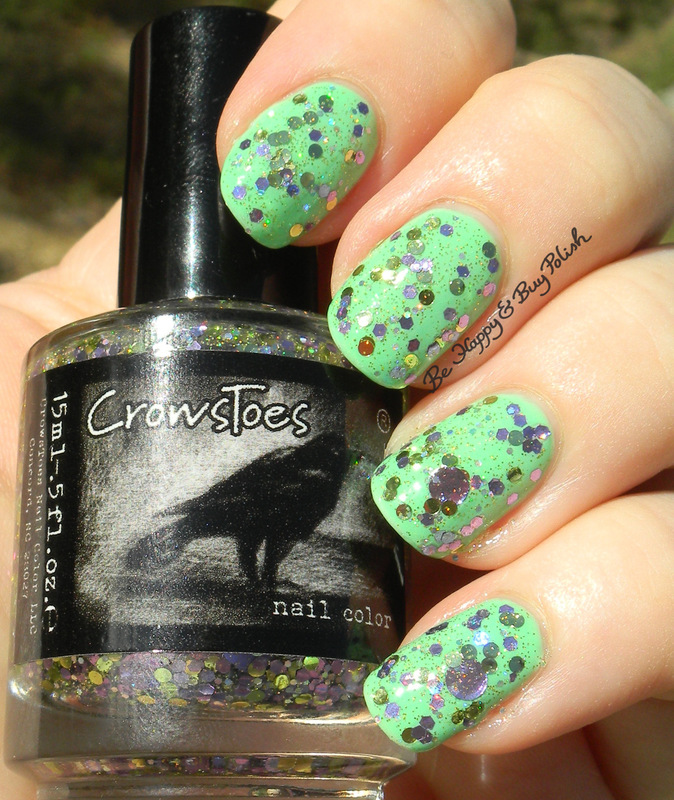 CrowsToes Boat Drinks is a clear based topper with small gold holographic specks, circles in gold and purple, and hexes in gold and purple. I’ve used 1 coat of Boat Drinks over 3 coats of Soft Green. I waited so long to buy Boat Drinks because I just wasn’t sure that I’d like it, to be honest. But now that I have it and tried it out, I adore it! The purple is perfect with the gold and the holographic glitters just are the perfect touch. Is there a polish you’ve been waiting on buying? What has held you back? Posted in Mainstream Polish, Manicures, Nail Swatches, pictures, Press Sample, reviews	by Jessica W.
Good Monday morning! I am dragging this morning, how about you? I took some medicine last night that totally knocked me out and I slept in way too long as a result. Guess that means I’ll be running behind for the rest of the day. Today I have two more Verity nail polishes to show you! Verity is a nail polish line sold through The Beauty Clutch; they have great prices and a great formula! You can pick up Verity polishes, and many more different brands through The Beauty Clutch. Be sure to also follow them on Facebook and on twitter for any upcoming sales! Well, it’s starting to warm up here, it’s going to be at least 40 for a high through the rest of the week! How’s your weather, has winter come to your area yet? Posted in Comparison, Mainstream Polish, Manicures, Nail Swatches, pictures	by Jessica W.
Good morning everyone! I have a comparison post for you today – something that’s been in the works for awhile. When I posted my swatches of OPI My Dogsled is a Hybrid, I had a few requests for comparisons to it. There wasn’t as many as OPI Damone Roberts 1968, but I did end up with 3. I know that doesn’t seem like a lot but every green I was going to match up against MDIAH came up too dark or too light. It was hard to find a balance! I ended up with Verity Asian Jade, Sinful Colors Open Seas, and Precision Nail Lacquer McDreamy. In my opinion, the closest one is Precision McDreamy, though it is still a bit more green toned than MDIAH is. Have you picked up My Dogsled is a Hybrid yet? Do you have a green that is a dupe in your stash? Let me hear it in the comments! Good morning everyone! How is your week going? I hope it’s fantastic so far. 🙂 I’m slowly getting better, woohoo! 😀 Today I have some gorgeous glitters from Verity via The Beauty Clutch. 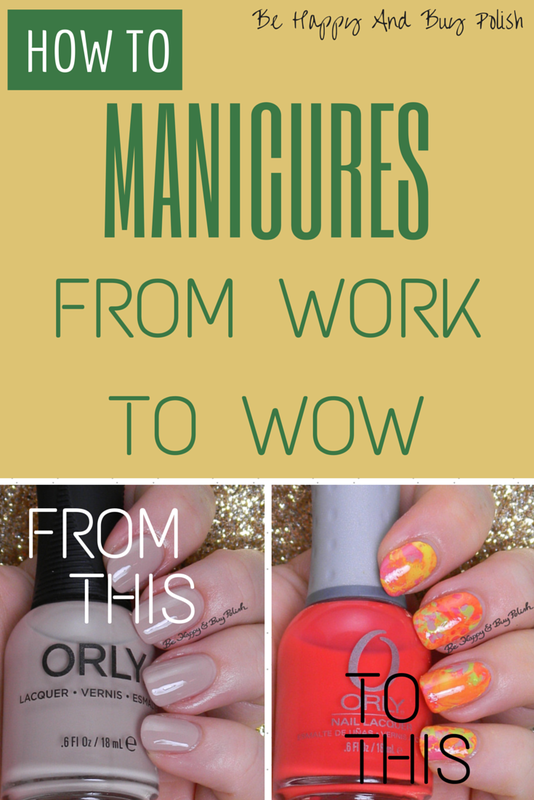 How To: Manicures from Work to WOW! Posted in Indie Polish, Mainstream Polish, Manicures, Nail Art, Nail Swatches, pictures, Press Sample, Tutorials	by Jessica W.
It’s Friday, hallelujah! Time to shed the work-week craziness and have some fun! So of course, I have a few manicures today to take you from work to WOW. Click through after the image to see all the beautiful manicures I have for you today! Today I have four Verity nail polishes via The Beauty Clutch to show you: Deep Violet, Lite Grey, Trick or Treat, and Grapes. Long story short: I love Verity polishes, they are amazing! Posted in 2014 Favorites, Indie Polish, Manicures, Nail Swatches, pictures, reviews	by Jessica W.
Good morning my lovely readers! Today I have a beautiful glitter topper to show you, so let’s get to it. 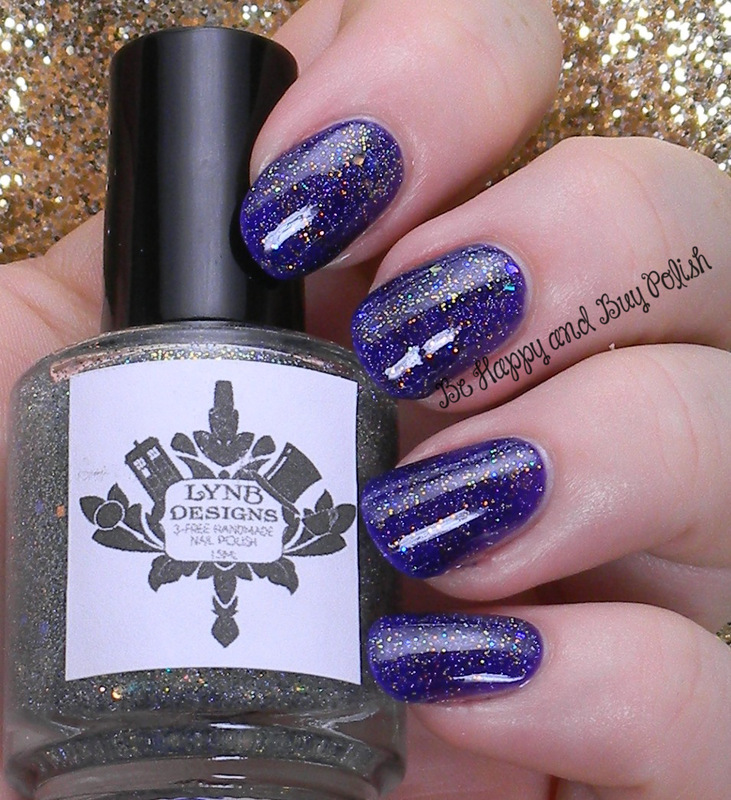 LynBDesigns Yukon Gold is a “glitter topper filled with iridescent glitters in all shapes, sizes, and colors. Micro holographic glitter and glitter that shifts from yellow to green to blue.” I have used one coat over Verity Deep Violet (two coats), with Barielle top coat. I really like the play of the iridescence and the holographic particles. Unfortunately, LynBDesigns Yukon Gold is no longer available via the etsy shop; definitely keep your eyes peeled for one available secondhand! I want to say thank you for your comments yesterday; the end of the week is my brother-in-law’s vigil and funeral. So, bear with me as my replies will be sporadic this week as I am helping my sister as much as possible. Thank you for your prayers, well-wishes, and thoughts.